In today’s hectic life styles, the ”drive thru” has become part of our every day life. We understand that removing the suspension from your motorcycle, finding the appropriate packing equipment, and then booking or driving to a suitable shipping depo can be a pain in the arse, especially if you are not necessarily mechanically minded, or if you simply don’t would rather not send your springy bits via the man with the white van. So we offer “ride thru”. But how does it work?? We house the ability for you to either wheel your bike into the workshop, or carry in items requiring attention. Just like booking an appointment to see the Dr! 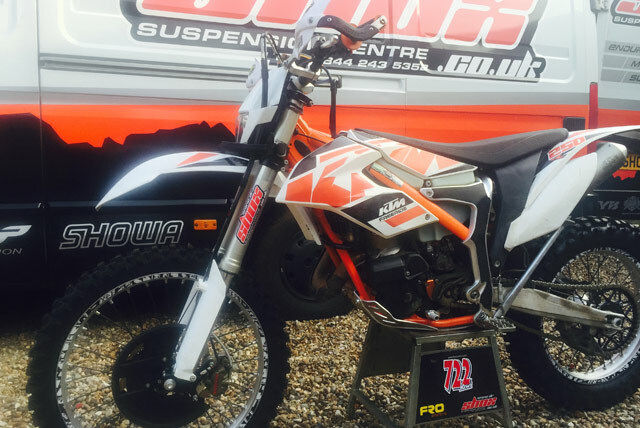 Phone up to book your sick bike or forks and shocks in. Make Sure we have the correct medicine (springs, seals, bushes etc) to fix sick parts. We have a waiting area so you can drink tea and coffee, use our wi-fi to catch up on some work. Drive to local places of interest, Mersea Island to sample some local fish and chip or a stroll up the beach! If you bring your road bicycle or mountain bike we can give you some great cycle routes. Come back to the surgery, where your items will be waiting for you, all spik and span, or the motorcycle will be sat there waiting for you, so we can quickly pop you on the bike, and make sure your rider sag is adjusted before you leave. Just the normal cost of a service or re-valve etc.. Only difference is your time and travel cost and of course the £50. To remove and refit your suspension, plus the benefit of getting your sag set if you bring the whole bike in. Send this in with your suspension, this also explains how to pack your suspension to send to us.